Sources: Compiled from China National Bureau of Statistics and China National Coal Association statistical releases. There may be a light at the end of the long dark tunnel: It appears China's coal boom is over. While positive signs have been emerging from China for well over a year, it appears the 'war on pollution' is not just talk. According to analysis produced by Lauri Myllyvirta and Greenpeace International in the first half of this year, China's coal use dropped for the first time this century -- while the country's gross domestic product (GDP) actually grew. 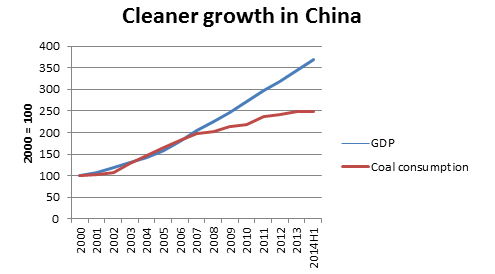 You read that right: coal and GDP growth have decoupled in China. At the same time, the growth of imports -- the seemingly endless source of optimism for the moribund U.S. coal industry -- ground almost to a halt, with only 0.9 percent growth so far this year, as opposed to more than 15 percent yearly figures we have seen since China first became a net importer. Topping off the trifecta of good news is that domestic production dropped by 1.8 percent [article is in Chinese]. While uncertainty over the changes in coal stockpiles still exists, we're confident that the unbelievable may be at hand: peak coal consumption in China. It's hard to understate just how historic this shift is. 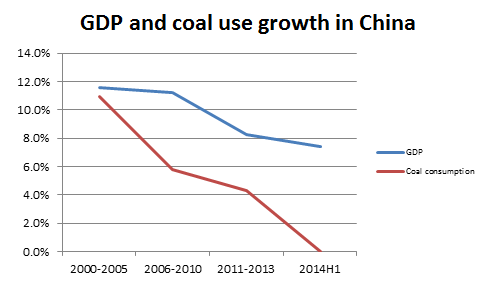 Analysts have been arguing over if, and when, Chinese coal consumption would peak. Some were forecasting a peak before 2020 while others -- including Wood Mackenzie -- have been loudly claiming Chinese coal demand may not ever peak but would instead double by 2030. This new data exposes the wide gulf between reality and hype that those predictions rely on. In a sign of just how dramatically the tables have turned on the previously skyrocketing projections for the coal industry in China, consider this: the China National Coal Association is now calling for a 10 percent reduction in second half domestic coal output in many of the main coal-producing provinces. That about face comes as quite a shock considering as recently as December, the Association was busy advocating for a billion tonnes of coal to be added to the Chinese coal market by 2020. My what a difference a year makes. But, it's important to understand how the many who still believe in the myth that Chinese coal demand can grow endlessly will respond to the news. Two easy to believe short-term explanations have already been offered for the slowing coal demand. The first is that China's economic growth is slowing and skyrocketing coal consumption will resume when the economy rebounds. The problem with this explanation is that while the first five years of the century saw coal use and GDP grow almost hand in hand, the second half saw them decouple. More importantly, the Chinese economy registered a year-on-year growth rate of 7.4 percent, which indicates that the fundamental growth pattern of the Chinese economy has changed. 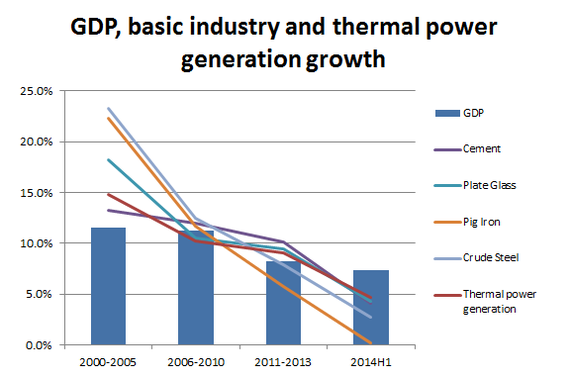 A widening gap between economic growth and coal consumption increases. Sources: Compiled from China National Bureau of Statistics and China National Coal Association statistical releases. The second explanation was offered by Bloomberg: a surge in hydropower generation offset coal use. China did indeed add a lot of hydropower capacity in the first half of 2014; however, the 9.7 percent year-on-year increase in hydropower generation was business-as-usual. In fact, the average for the past five years was 9.3 percent. This increase in hydropower was only capable of changing the coal consumption growth rate by less than one percentage point, which hardly changes the big picture. So, what's really going on? The times they are a changing, and the Chinese economy is changing with them. We're finally starting to see movement away from the energy-intensive fossil fuel industries and investments that fueled China's rise. 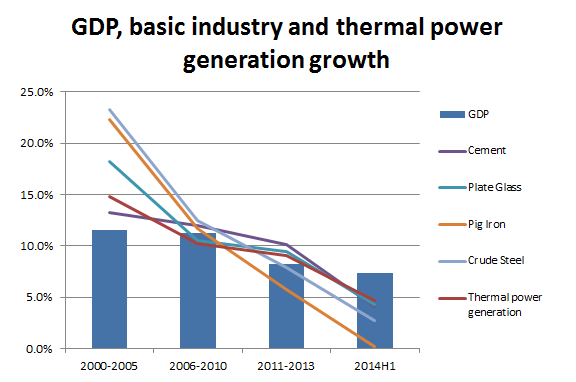 Basic energy-intensive industry products are no more the engine of growth in China. Source: Compiled from China National Bureau of Statistics yearbooks and press releases. It has been long acknowledged that, in China, investments and a heavy reliance on industry cannot sustain growth while the services sector and household consumption remain suppressed. This adjustment seems to be slowly progressing, with growth in services (excluding real estate) and private consumption only recently outpacing the manufacturing industry. While still nascent, if this restructuring gains pace, along with the promising growth in clean energy, there is much reason for optimism. But there is still a long way to go from a peak in coal consumption to the necessary reductions needed to move toward a clean energy future. Fortunately, this change does not have to be linear, and interestingly, it seems Chinese investors were ahead of the curve as many have been busy shifting their money from coal to clean energy over the past few years. It looks like the smart money in China has long realized what the data is now showing: bullish predictions on future coal growth are unfounded, and clean energy is the future.